So Why Two Sets of Graphics? To answer this question, there can be a few possible answers. The cynical approach is to say that Intel is rehashing a H-series design for the CPU portion, so rather than spending money to make masks that cuts it off, Intel is being cheap for what would be a low volume product. A technical reason, which readers may or may not agree with, is to do with functionality and power. Despite these chips being 65W and 100W, we are going to see them being used in 15-inch and 17-inch high-end devices, where design is a lifestyle choice but also battery life is a factor to consider. For doing relatively simple tasks, such as video decoding or using eDP, firing up a big bulky graphics core with HBM2 is going to drain the batteries a lot faster. By remaining on the Intel HD graphics, users can still have access to those low power situations while the Radeon graphics and HBM2 are switched off. There is also the case for Intel’s QuickSync, which can be used in preference of AMD encoders in a power-restricted scenario. The Radeon graphics in this case offers power-gating at the compute-unit level, allowing the system to adjust power as needed or is available. It provides an additional six displays up to 4K with the Intel HD graphics that has three, giving a total of nine outputs. The Radeon Graphics supports DisplayPort 1.4 with HDR and HDMI 2.0b with HDR10 support, along with FreeSync/FreeSync2. As a result, when the graphics output changes from Intel HD Graphics to Radeon graphics, users will have access to FreeSync, as well as enough displays to shake a stick at (if the device has all the outputs). 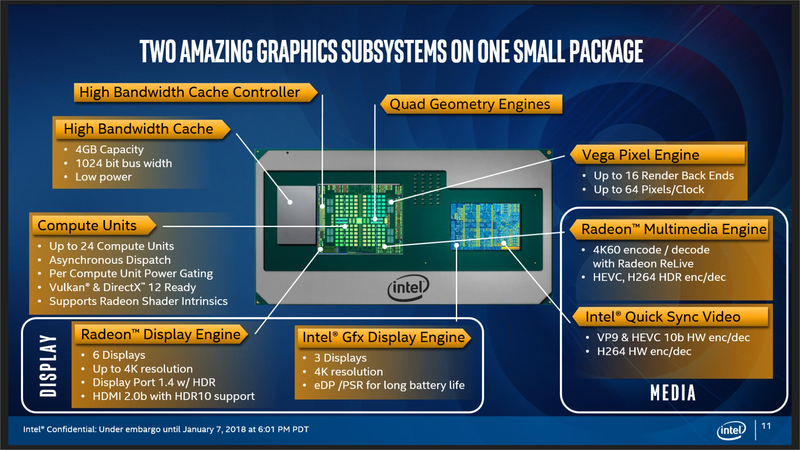 Users that want these new Intel with Radeon Graphics chips in desktop-class systems, might not find much use for the Intel HD graphics. But, for anything mobile or power related, and, especially for anything multimedia related, it makes sense to take advantage of the Intel iGPU.